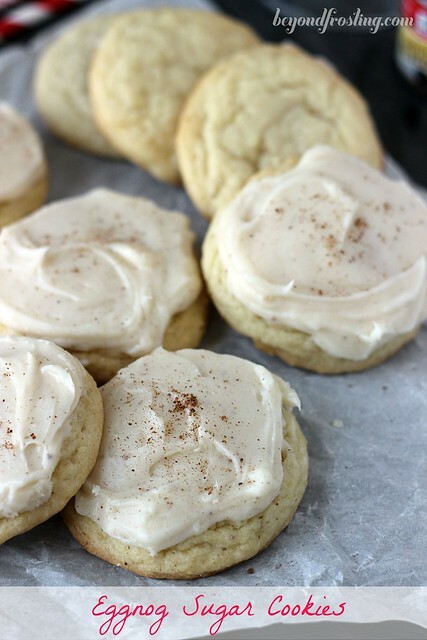 These Melt in your mouth eggnog sugar cookies are a soft-based sugar cookie flavored with nutmeg and topped with a creamy eggnog buttercream. Oh, have you heard that I love eggnog? 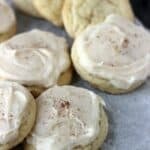 I posted a could recipes before the end of November because I really just couldn’t wait to share them with you. 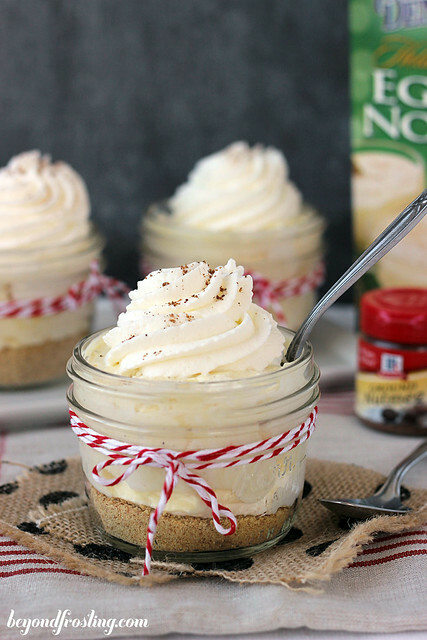 Be sure to check out my Eggnog Cream Pie Parfaits and my Ultimate Eggnog Poke Cake. Turns out, I am not done with eggnog yet! 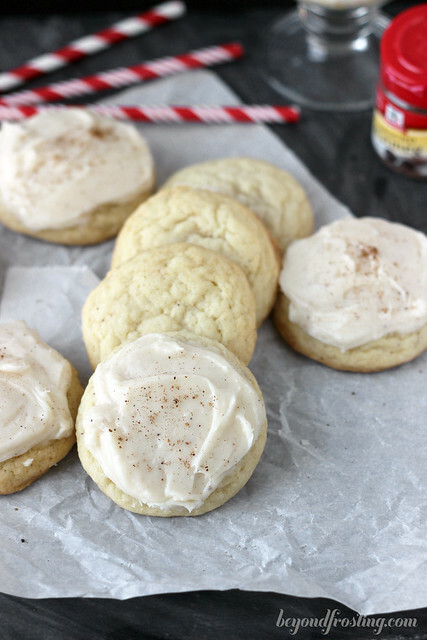 These Melt Away Eggnog Sugar Cookies are down right perfect. The minute you sink your teeth in for the first bite, you won’t be able to stop. Be sure to check out my other recipes from cookie week: Peppermint Cream Pie Cookie Cups, Orange Cranberry Almond Bark, Soft Baked Molassas Cookies with a Brown Butter Glaze, Andes Peppermint Crunch Cookie Dough Truffle Bars. 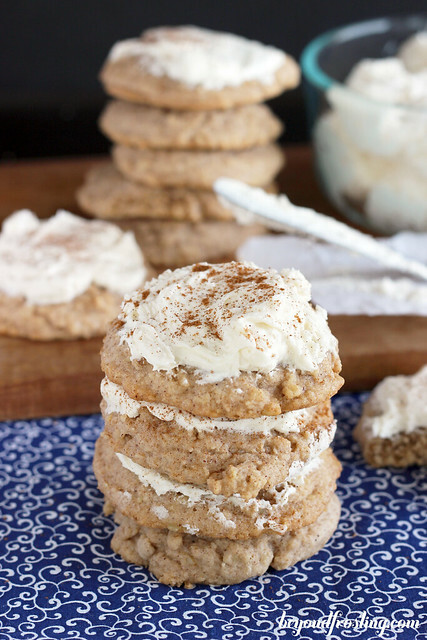 My boyfriend’s family has this incredible snickerdoodle recipe that is soft and pillowy (it’s a word). It really makes for the perfect cookie. For this cookie, I omitted the cinnamon and sugar, and flavored it with nutmeg for a bit of spice. 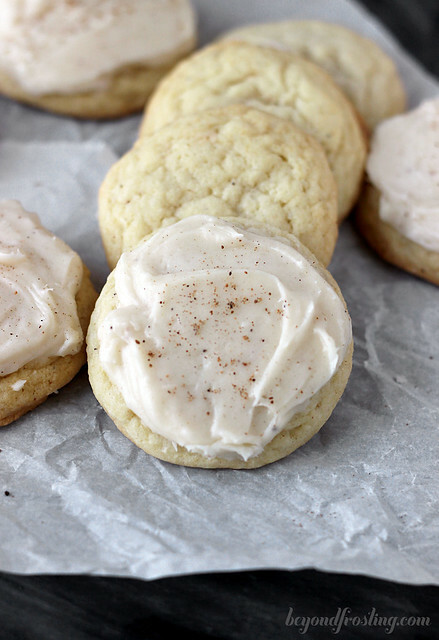 Every sugar cookie needs a frosting .This frosting is an eggnog buttercream. Besides the basic butter and powdered sugar, I added more nutmeg and eggnog right into the frosting. 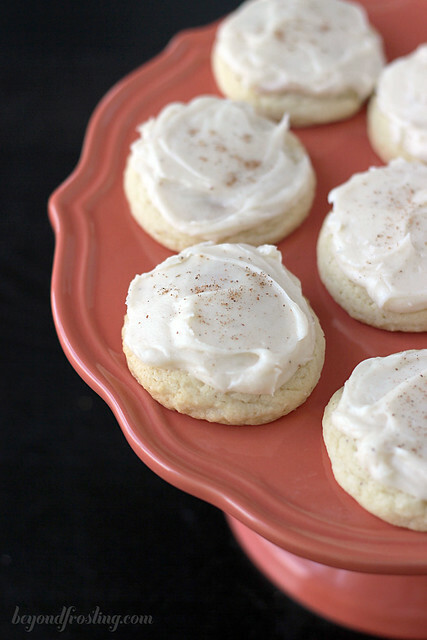 If you are planning to serve these cookies the next day, feel free to leave them out on the counter for awhile. 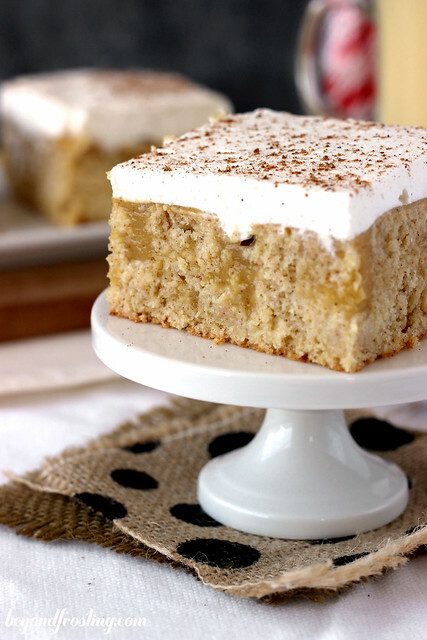 The frosting will get slightly crust on top, allowing you to stack them easier. However, don’t stack too high or you will crush the frosting. 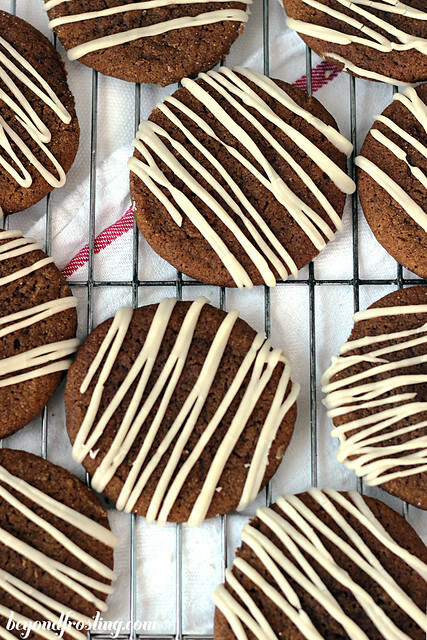 For this recipe, it can make enough cookies to serve a crowd, or it can easily be halved. The original recipe calls for the dough to be refrigerated for an hour, I find that the cookies tend not to spread as much if I refrigerated the dough. However, I am too impatient, so often times, I will let it sit in the fridge for only 30 minutes or so and keep it refrigerated between batches. Did I mention these cookies were perfect? 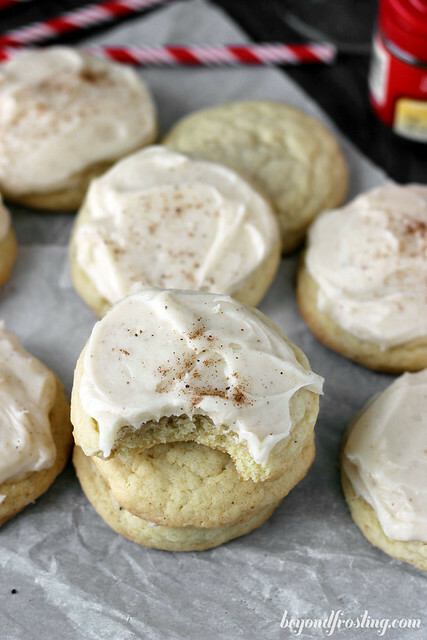 This Eggnog sugar cookie might just end up replacing your favorite sugar cookie. Keep up with all the happenings!